What is Moblin Maze Mongers? Moblin Maze Mongers (hereafter "MMM") is a new system that allows players to create built-to-order dungeons ("mazes") with custom settings and rules, that can be enjoyed alone or together with friends. Users must have installed and completed registration for the Wings of the Goddess expansion in order to access the Moblin Maze Mongers system. To enjoy MMM, please follow the steps below. Maze Tabulae are used to record the fundamental data for your maze. 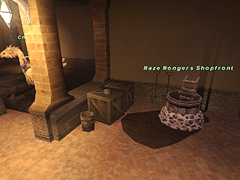 By using Maze Vouchers and Maze Runes in conjunction with a Maze Tabula, various settings of the maze may be configured. The Maze Voucher dictates the objective for completing a given maze. In a process similar to learning new magic from a scroll, Maze Vouchers must be selected and used from the item list. This will store the vouchers in your MMM pouch, allowing them to be used in maze creation. 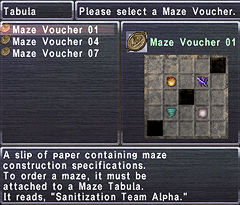 Maze Vouchers that have been stored in your MMM pouch can then be accessed from your Maze Tabula interface. 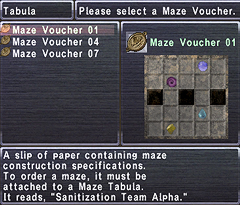 Selecting a Maze Voucher to use with your tabula is the bare minimum requirement for ordering a maze. Maze Runes are optional components that allow for control over more detailed settings. They also come in various shapes and elements, and can have a wide range of effects on the content of your maze. Like Maze Vouchers, Maze Runes must be used and stored in your pouch before they can be accessed. 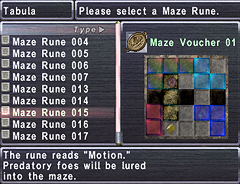 The specific effects of a particular Maze Rune may change, or the rune may become unusable, depending on the type of Maze Voucher with which it is used. 2. Use the Maze Vouchers and Maze Runes you have obtained. Using these items will cause them to disappear from your item list, but they can be accessed at any point thereafter through your Maze Tabula. 4. Take your completed Maze Tabula to the Chocobo Stables in Lower Jeuno (G-11) and trade it to the Maze Mongers Shopfront located there. After confirming the maze settings and paying the construction fee, you and any party members with you will be transported to the maze entrance lobby. 5. Conduct any pre-entry preparations you see fit before entering your maze. Talking to the NPC Packapic will allow you to confirm your maze settings and even customize the music. When you are ready to enter the maze, you may do so by speaking to the NPC Rediroq. 1. Select and use the Maze Vouchers and Maze Runes in your inventory to place them in your MMM pouch. 2. Use your Maze Tabula. 3. Choose your desired maze completion objective by selecting the corresponding Maze Voucher. Maze Voucher 01: Clear the maze of all monsters. Maze Voucher 02: Slay the waves of enemies that descend upon you. Maze Voucher 03: Kill enemies on five floors. Maze Voucher 04: Synthesize the assigned items. Maze Voucher 05: Train Chaperix to protect his village by proving himself in battle. Maze Voucher 06: Retrieve the requested number of treasures without being discovered. Maze Voucher 07: Slay a single formidable foe. 4. Use Maze Runes to configure more detailed settings, if you so desire. Maze Tabulae may contain black squares and/or elemental squares. Black squares cannot hold Maze Runes. Please rotate your desired Maze Runes as necessary so that they do not overlap with these squares. If you place a Maze Rune in an elemental square of the same element, the effect of that Maze Rune will be enhanced. Please note that the concepts of elemental ascendancy and opposition do not apply in maze construction. There are also neutral Maze Runes that are not aligned with any particular element. Such runes will never have their effects enhanced, regardless of the squares on which they are placed. Maze Rune 100: The quicker you complete the maze, the more Moblin Marbles you will receive. Maze Rune 101: Your time limit is shortened, but you will receive a greater quantity of Moblin Marbles (see "Rewards" below) upon successful completion of the maze. Maze Rune 106: You will be outfitted with a "Maze Pearl" that can be used to obtain various helpful hints. Maze Rune 109: The NPC "Packapic" in the entrance lobby will sell you temporary items. After successfully completing the objectives for a given maze, you will be rewarded with the appearance of a treasure chest. Opening the chest will grant you items, experience points, and "Moblin Marbles." Moblin Marbles are points obtained exclusively through MMM that can be exchanged for equipment, new Maze Runes and so forth. 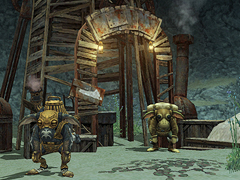 For details, speak with the NPC Chatnachoq in Muckvix's Junkshop in Lower Jeuno (H-9). There are no level restrictions placed upon the act of ordering a maze or adventuring in a completed maze. You may enter mazes alone, or in parties of up to six characters. A player may only order one maze per day (Earth time). There are, however, no such restrictions placed on the number of times a player may enter mazes as a member of a party whose leader has made the order. If you wish to leave a maze before completing its objectives, you may do so by using the "Maze Compass," an item that is automatically placed in your inventory upon entering a maze. Chances are any of these NMs will spawn by choosing Journeyman with the proper associated Rune #. Maze Demolisher will spawn when gathering items for "First we see what you can do." This page last modified 2018-09-08 08:41:08. Why are the rewards such crap?